Part 16 of my series of Kiss reviews, leading up to the release of Monster! As a kid I remember loving this album cover. I loved any album cover that was different, and you could stare at trying to make out the details. It didn’t occur to me that this cover represented a newer, cartoonish Kiss far removed from the one on the Destroyer cover. Indeed, if Kiss were falling apart at the seams on Dynasty, now they had truly run out of steam. Peter Criss was effectively gone, and Anton Fig played the drums on all tracks once again. The band were increasingly separated. Ace Frehley played all the basses on his own songs, and even Paul played bass on a couple of his. “Shandi”, the top 10 single in Australia, featured no Kiss members at all, except Paul Stanley. The public never knew this at the time. Unmasked, on the surface of it, was a newer brighter poppier Kiss, but underneath there was nothing new about the fragmenting that had set in years earlier. Vini Poncia (Dynasty) was brought in to produce once again, hot on the heels of “I Was Made For Loving You”. Kiss had never sounded so pop, with keyboards in the forefront and compression on the drums. The soft production removed the normally thunderous lifeblood from the songs. This all went hand in hand with their increasingly colourful image. Indeed, the demo and live versions available elsewhere reveal a heavier Kiss, almost punk-like in delivery. There are some good songs here, most notably Ace’s. Heavy on melody, “Talk To Me” and “Two Side Of The Coin” feature some great soloing by the Spaceman. “Torpedo Girl” is campy but fun; imagine Kiss doing a summer beach song. It’s odd but, I like it. Paul’s “Shandi” is a great song, and continues to be a great song when it is performed on special occasions by the band. Gene Simmons once again is underreprensented here, with only three songs: “Naked City” (OK), “She’s So European” (better) and “You’re All That I Want” (best). It is arguable that Unmasked wasn’t even the nadir, that Kiss sank even lower of the next album, Music From The Elder. I don’t agree with that. The Elder may have failed as an album, but it did succeed in bringing some seriousness back to the table and some rock values back into the production. 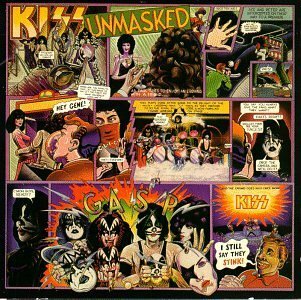 To me, Unmasked represents the nadir, maybe not the worst album Kiss ever made but probably the least Kiss-like. Even so, many of the songs are well crafted and memorable. It won’t be something you want to listen to in the car with the windows down, or anywhere that someone might overhear you! Definitely worse than The Elder which I think is really underrated. But still not bad… got a real soft spot for Shandi, Naked City and Easy As It Seems. Like you say, Ace’s songs are all good here. He seemed to be the keeper of the flame at this point!